What's the Name of Your Violin? A German violin purchased in Paris: Herr Frank. It reminds me a lot of my own, also identified by a good dozen people as an early 20th century Markneukirchen. Thank you all for your answers. Is there a simple way to know if it has been re-varnished? Thank you for your replies. There is no cleat that I can see on the back seem. I always thought of antiquing as a modern practice. Was it common for early 20th century German makers to antique their products this way? With every player having unique physical proportions it seems to me that bow hold should be unique to each player (and I think it is safe to assume that it is...) What we should really define is what we need to achieve with the bow in term of range of motion and pressure. Then, starting from a standard position, each player has to find what works best for the proportions of their hands, fingers, arms, shoulders etc. The very existence and persistence of different "standard" bow holds actually demonstrates that there is no such thing as the "right bow hold." If there were an obviously superior bow hold, you would think that after 300 years we would all have converged on it. Shoulder rest effect on tone? Sorry to resurrect an old thread but I had a shoulder rest experience a few nights ago. I am an adult beginner and I find playing without a shoulder rest much more comfortable (I dislike the stiffness in position I seem to adopt when using one.) At the same time, I acknowledge that the extra support obviously makes playing easier. So, I tried to put my shoulder rest back on this week and I could not stand the tone of my violin. 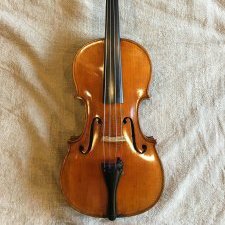 I play an regular early 20th century Markneukirchen that projects quite a lot and has a high content of high-frequencies (which is why I tend to gravitate toward warmer strings.) Using the shoulder rest made all these high-frequencies pop out again, as if I had switch to steel strings. I assume that the contact of the back with my collarbone dampens them. Reminds me of the famous quip: "I am not young enough to know everything." Thank you for clarifying Michael. I was confused by online references on the evolution of the instrument. Thank you. Thank you for your replies. It was not sold to me as anything extraordinary, just as an early 20th century beginner study violin, so this is all very consistent. I become interested in the origin because of the dimension. To the uneducated, online resources seem to imply that there is a linear progression from Baroque to Classic/Transitional to Modern dimensions. I was therefore curious to know why a modern violin would have dimensions that seem to be associated with the Classic era. I am assuming that the progression was anything but linear and that modern standards are a very recent concept. Is that correct? Hello, I am trying to identify the age and provenance of a violin I purchased 20 years ago in Paris. 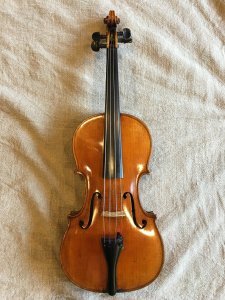 There are no markings except for an inscription (unless it is just scratches...) on the button, that reads "11/11" The dimensions are not that of a modern standard violin: Length of back: 356 mm Body stop: 198 mm Neck stop: 135 mm Body width: Front - 163 mm Inner - 108 mm Back - 207 mm Thanks in advance for your help.